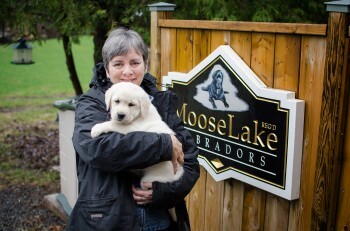 MooseLake is a small kennel situated in a country setting on 8 acres of nature trails for our Labradors to enjoy. We are located in Kanata, Ontario (near Ottawa). 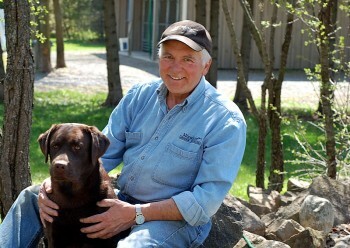 MooseLake began in 1996 when we purchased “Chelsea” our first show Labrador Retriever. Our prefix ‘MooseLake’ originated when we lived on the shore of Lac l’Orignal (Moose Lake) which is in the small village of Val Des Bois, Quebec. Over the years, we have produced top conformation champions, therapy dogs, titled hunting dogs, titled competitive obedience dogs, titled agility and most importantly great family pets. It is the Home of 52 Canadian Champions. We produce quality healthy Labrador Retrievers with exemplary temperament, breed type and structural soundness. All our pups are registered with the Canadian Kennel Club, microchipped (www.microchipsolutions.com) and leave here with 6 weeks of free pet health insurance through the Pet+ Us (http://www.ppubreedertrial.com). We recommend pet insurance, when the unexpected happens it can be incredibly costly to provide good health care to our four legged family members. Pet insurance can help with those unexpected costs and provide a stress free sense of responsibility in providing vet care to our pets . Costco.ca has partnered with Pets + Us, and provides a discount through your Costco membership. Visit Costco.ca and search my pet for more information. We provide a written health guarantee for their first two years from any hereditary defects. Preliminary vaccinations and de-worming is completed prior to leaving at 8 weeks of age. We breed the only three officially recognized colors: Black, Yellow and Chocolate. Our Labradors are certified hips, elbows and have their eyes checked by a Board Certified Veterinary Ophthalmologist. At least one parent is Optigen A so the pups will never be diagnosed with Progressive Retinal Atrophy (PRA). All buyers must complete the questionnaire. We do not sell to pet stores or commercial dealers for re-sale. We do not sell two puppies at the same time to the same person. All buyers are screened to ensure the puppy has a safe, loving home. All buyers must plan a visit to meet our Labradors and us. Once approved, a non-refundable deposit is required, will be placed on the wait list for a puppy. We require all buyers to sign our Return Policy; if for any reason they are not able to keep their Labrador he/she will be returned to us for proper placement at any age. MooseLake Labradors is sponsored and supported by K9 Kanteen. K9 Kanteen is a small business, operating in the Ottawa area that brings quality national pet foods and supplies to its Club Members at affordable prices. It offers only the best nutrition for your pet at the best possible price. 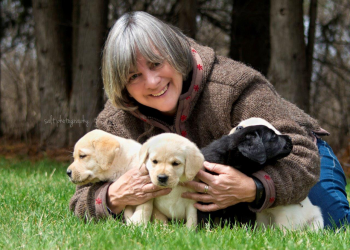 Without the support of K9 Kanteen, MooseLake would not be able to operate as it does today, selecting the very best Labradors for it’s the breeding program. To learn more about K9 Kanteen and whether you can benefit from this service, check out the website tab, About us.